It's more or less inevitable that, sooner or later, you'll spend a holiday season apart from someone special to you. Whether it's a sibling freshly emigrated to sunnier climes or a close friend who has moved cities to take up a new job, we all know the dull ache that comes from missing someone during an important time. Fortunately, as technology has got cleverer and cleverer, it has also become easier and cheaper to stay in touch. With broadband near-ubiquitous in the first world, and gaining a substantial foothold elsewhere, it's become the norm to fire up Skype in an evening or early morning to chat with a far-flung friend or relative via a video call, all without spending a penny – something that was firmly the preserve of science fiction books and films until recently. The myriad of ways to stay in touch with people – phoning, chatting via text or sending physical reminders through the post – have also made it to your iOS device, and sometimes in spectacular ways. You might find yourself sending your gran a postcard while you're on your way home from work, or calling a friend in New York for free over your iPhone's 3G connection, for instance. Alternatively, you might use Blurb to create a completely new take on the traditional family Christmas letter by creating a bespoke ebook to share with friends and relatives. Or, you might make complicated family outings over Christmas easier by getting a few relatives connected to Google's Latitude service, avoiding the spectre of losing Uncle Roger on the New Year's Day hike. We've rounded up the apps that will best help you to stay in touch, whether your loved ones are in the next room or on another continent entirely . Read on to uncover the very best available! Skype is closing in on 700 million users – and if that alone isn't enough to prove that it's one of the most successful technologies of our age, consider the fact that it's one of only a handful to become a verb. It's easy to see why, too – its service is efficient, high-quality and surprisingly resilient in the face of low-bandwidth connections. 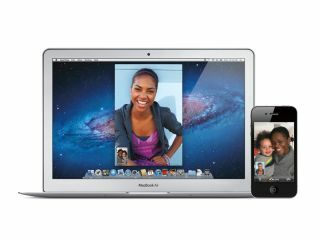 If you've got a device with a front-facing video camera – think the iPhone 4 and 4S, the iPad 2 and the fourth-generation iPod touch – then video calling works in much the same way as FaceTime. If you've got a device with a rear-facing camera, Skype still makes an attempt at video calling, although if you want your friend to see your face you'll need to find a convenient mirror. It can still be a fun way of streaming a family get together to a distant relative, however. Most impressive is Skype's ability to with-stand a dodgy internet connection. For video purposes, this means even geographically distant relatives can be near-instantaneously chatted with, even if both participants are on standard broadband connections. We've had some notable successes making surprisingly clear voice calls on patchy wireless signals in far-flung places. The app is a fully featured piece of telephony software: the ability to take part in (but not host) multi-person conferences, put people on hold and mute your device's mic are all included. Skype can also communicate with Bluetooth headsets – ideal for iPod touch users, some of whom need to supply their own headset with a microphone. Best of all, Skype is free. If you're calling a fellow Skype user, there's no charge for either voice calling or video calling, and unlike FaceTime, Skype is multi-platform. If your interlocutor is on another iOS device, things will work fine – but the same applies if they're on a desktop PC, a Symbian mobile device or an Android tablet or phone. If you're trying to get in touch with people who aren't on Skype, but are on standard landlines, you can use Skype's apps to get in touch with them as well, for a very reasonable price. The apps themselves behave slightly differently depending on whether you're paying for Skype. If you've only got a free account then the apps are ad-supported. You may well find Skype worth paying for, however. There are some imperfect elements to the apps, however. For one thing, although Skype allows Push notifications, it doesn't 'ring' unless it's running in the background on your device, and there's lots of anecdotal evidence suggesting that leaving Skype running all day is a great way to run down your battery. This is particularly true if the only data connection you have is 3G, which is much harder on batteries than Wi-Fi. However, as a way to get in touch with people, wherever they are, and whatever kind of internet connection they have, either for free or for very little cost, there's currently nothing out there to touch Skype. Whether you think Google Latitude is cool or desperately creepy will depend on your perspective. The app harnesses Google's aptitude for mapping and geolocation, as well as your iOS device's ability to locate itself, and puts the two together to create an app that not only knows exactly where you are – as the standard Maps app does – but also broadcasts that information. Crucially, it only broadcasts that information within a strict set of parameters. This isn't like Facebook, where anyone can add you as a friend. You log in with your Google account (for power users, Google Apps accounts are supported), and then you can invite others to share their locations with you. When someone sends you a request, you can confirm or deny it, and you can also set overriding settings for all the people you've already confirmed – setting a location manually, for instance, or not sharing one at all. Given a big enough group of friends it's a fun app to have, and can certainly come in handy if you're trying to find someone either in a big crowd (think shopping on Oxford Street) or in a large space (a festival, perhaps). The app – which isn't Universal, but can function on all iOS devices (iPod touches can still use geolocation services when they can see some Wi-Fi networks) – works well, although a curious blind spot occurs when you try to get directions to another Latitude member: it switches to the Maps app, despite containing a map itself. It's also worth bearing in mind that Latitude updates your location even when the app isn't running – so this is one app definitely worth keeping an eye on once you start using it. The good thing about Skype is that it's got a huge number of users. Annoyingly, though, not everyone uses it, and chances are your friends are spread over a fairly wide range of social-networking and instant-messaging services. Enter Verbs, which consolidates services with hundreds of millions of users into one tidy, pared-back app. Verbs covers Google Talk, AOL Instant Messenger, MobileMe and Facebook, and getting started is as simple as supplying your credentials for each service. From the home screen you can either sort your contacts so they're shown by the service they're subscribed to, or you can show all of your offline and online contacts at the same time. Each chat with a different contact takes place in its own window, using the same animations and layout as Safari's multiple windows. Unusually for an instant messenger app, there's a file-sharing option, which gives you the option of connecting to either CloudApp or Droplr to share images. Verbs works through the XMPP (Extensible Messaging and Presence Protocol), an open standard used by the chat services it supports. That means it's possible to use other apps to chat with users on multiple services, such as AOL's AIM for iPad app – not covered in depth here because it's iPad-only. Still, if you've got lots of contacts split across several services, Verbs is likely to cover a lot of them in one fell swoop, even if it can't claim to do everything. We at Tap! can't find much to recommend Windows Live Mail over services such as iCloud or Gmail, but Windows Live Messenger is another kettle of fish. For one thing, it's estimated to have over 300 million users per month, so it's likely that someone you're fond of uses it to stay in touch, making this free app a sensible addition to your device. The app's headline feature is its ability to connect Windows Live Messenger with data from other services. In this case the big fish is Facebook, but WLM can also dial into Yahoo! 's Y! Messenger, as well as providing connectivity to Flickr and, er, MySpace, for those lodged in the previous decade. The app itself works really well: instant messaging text chats run smoothly, and handy notifications pop up if a message appears when the app isn't at the front and centre of your screen. Slightly disappointingly, the email feature turns out to be merely a wrapper for the mobile version of Windows Live Mail, but this app is otherwise a solid option for those wanting to stay connected to people solidly wedded to Microsoft's social media efforts. The Facebook app is the world's biggest social-networking site is glorious in its iOS incarnation, with big, easy-to-use icons, plenty of detail and lightning performance, even on older devices like the iPhone 3G. There's plenty of use made of Push notifications, so relevant activity – such as someone commenting on your status or tagging you in a photo – appears instantly, allowing you to take immediate action. Privacy advocates can take some comfort in the fact that the full range of account actions – including removing your details from Facebook entirely – can be done from the app. For those signed up to sharing their lives, this is an effective, free way of staying in touch, and its its unwaning popularity only bolsters its appeal. Bump is an ingenious free app that detects nearby Bump-enabled phones and lets you quickly send images, contacts, calendar entries and plenty more by 'bumping' your phones with the person in question. Once two phones become aware they've been bumped, your image (for instance) is sent over the web, so this isn't a potentially handy peer-to-peer connection: you need to be online. You can also send data to people further afield by adding friends from your address book. When Bump has a connection it works sensationally well, and it's such a light download that it's worth recommending whenever you need to send things to anyone. Perhaps our favourite feature is the social networking aspect, which connects to Facebook, LinkedIn and Twitter. Choose the appropriate network and bump phones, and your request will show up immediately, saving your new friend the hassle of searching for you online. Nice! For communicating with your wider network of friends and colleagues, we wouldn't be without Twitter. The trick is finding an app that distils the data into a manageable trickle, and Tweetbot fits the bill. At its heart it's a Twitter client not unlike the free official version, giving you the ability to quickly manage tweets from others, as well as being able to view retweets, track conversation threads and contribute your own voice to the conversation. Along the way, there are plenty of gestures. For instance, a swipe right gives you the conversation history between two people – useful for getting to the bottom of what's caused the latest spat. The app is extremely fast, and supports Twitter add-ons such as the bit.ly URL shortener, various image and video hosts, and adding to your read-later pile via the superb Instapaper, along with a few others. If only it were available for the iPad. iMessage is one of our favourite iOS 5 features, but the limitation of only being able to communicate with other iOS users is grinding. WhatsApp Messenger is effectively a cheap way of bringing multi-platform text messaging to your device. You don't send messages to a particular phone number, but to other WhatsApp users. This is still fairly restrictive, but the WhatsApp app is available on iOS, Android, various flavours of Symbian, Windows Phone 7 and BlackBerry, so there's plenty of scope for your friends to join in with the fun (and you can invite them from within the app). You can create group conversations, send images and videos, share your location and even record audio notes, though Skype remains our firm favourite for voice chatting. But with plenty of Push notifications, WhatsApp is a clean, very well-featured way of messaging anyone on a compatible device. Apple has a good reputation when it comes to designing and producing many printed goods, as anyone who's bought a photo book through iPhoto or Aperture will attest. Cards is an app that brings Apple's attention to detail to bear on the humble art of printing greetings cards. And if you're horribly behind on this year's quota, Cards gives you a great chance to send cards out while you're on the go. The app is classic Apple. It's simple and gracefully animated, giving you a clear impression of where you've come from and where you're going. It's also iPhone-only, though, which seems like rather a waste. Creating a card – the finished versions of which are printed on heavy cotton paper – is simple. You can add an image from your own camera roll or, better still, an image side-loaded to your phone through iPhoto. Positioning and sizing a shot is simple, as is adding text to the interior. Once done, tap in an address on the envelope (Americans, the lucky souls, can even add bespoke stamps) and tap in the price. Cards cost £3.99 to the UK, and this price includes the postage. Those interested in photography are likely to know what Blurb is already. For everyone else, it's a company that creates beautifully bound and printed photobooks. Blurb Mobile is the company's attempt to bring that self-publishing magic to the iPhone, iPad and iPod touch. The idea is simple – pick a number of photos (the free version gets you up to eight; purchase the Plus version for £1.49 through an In-App Purchase to bump that up to 15), and have them either placed independently or in a layout. Next choose a theme, then publish your mini ebook to Blurb, where you can either have it accessible to anyone with the right URL, or the world in general. You can write captions, or even include audio clips. It's an ingenious way of putting a modern spin on the round-robin family letter.